The Yankees came into the rubber game looking to get their offense going and their first series win of the year. 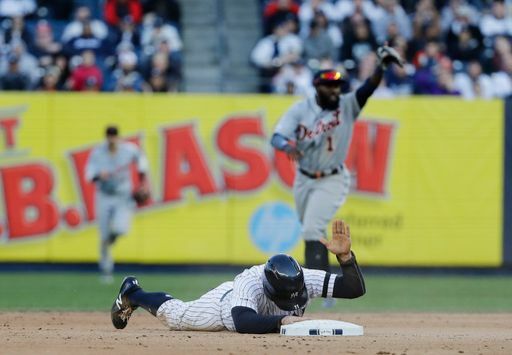 However, neither one of those things happened as the bats continued to struggle, leading to the Yankees losing their second consecutive game and series by a score of 2-1. The Yankees struck first in this one, when D.J. LeMahieu got things started in the bottom of the third with a double to left. Aaron Judge followed that up with a single to right, scoring LeMahieu and giving the Yanks a 1-0 lead. This would turn out to be the only highlight for the Yankees’ offense, who went on to strikeout a total of 18 times today. The top of the fourth did not go as well for the Yankees. Tyler Wade replaced Troy Tulowitzki, who had to exit the game with a left calf strain. Another throwing error by Gary Sanchez allowed Nicholas Castellanos to advance to third before Jonathan Loaisiga walked the next two batters. The Tigers got on the board with a sacrifice fly from Christin Stewart, tying the game. Loaisiga was able to avoid any further damage by striking out John Hicks and stranding two runners. Jonathan Holder took over for Loaisiga in the fifth, who gave the Yanks a solid outing with zero runs allowed in innings. Neither offense was able to get anything going until the top of the eighth when Gordon Beckham homered off Chad Green to give Detroit a 2-1 lead. New York’s pitching staff did their job today, but the bats did not do enough, scoring just one run on five hits. The Yankees did show a little bit of life on offense late in the game, when Luke Voit got on with no outs to start the eighth inning. This was followed by two strikeouts, one each by Gary Sanchez and Gleyber Torres. With two outs and Bird at the plate, Brett Gardner pinch ran for Voit, but was thrown out attempting to steal second. The Yankees head to Baltimore Thursday afternoon for the Orioles’ home opener, with first pitch at 3:05 EST. The probable starters are James Paxton and Alex Cobb.